President-elect Donald Trump has nominated Tom Price to lead the Department of Health and Human Services (HHS), placing the Georgia Congressman in an extremely powerful position as far as the nation’s health is concerned. Given his dubious track record, this appointment is of serious concern. As HHS secretary, Tom Price, 62, will serve as the country’s health czar, overseeing healthcare, food safety, drug prices, access to abortions, and biomedical research. He’ll manage of number of critically important federal agencies, including the National Institutes for Health, the Food and Drug Administration and the Centers for Disease Control and Prevention. This cabinet-level pick—which still requires Senate approval—makes Price the most powerful person in US health policy. As a former orthopedic surgeon, and as someone with extensive public policy and budget experience, Price is reasonably well equipped to handle the position. Trouble is, his fiscally-paranoid and socially-conservative views threaten to set the US back years. 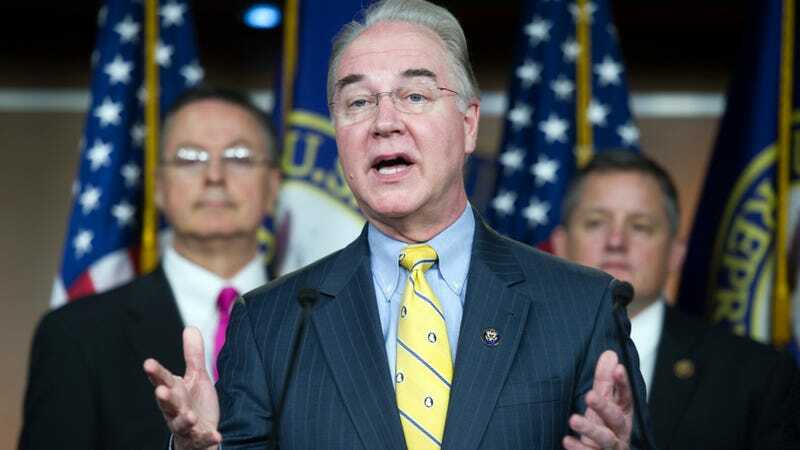 While chair of the House Budget Committee, Price demonstrated his commitment to limited government and lowering spending. He has ties to the House Tea Party caucus, and has unabashedly condemned the “vile liberal agenda that is threatening everything we hold dear as Americans.” Gay rights groups say he’s “completely unfit” to serve as health secretary (he’s opposed to gay marriage), and he holds a zero percent rating at Planned Parenthood (for reasons we’ll get to in just a bit). One of the first items on Price’s agenda will be to dismantle Obama’s Affordable Care Act (ACA), of which he’s a vociferous critic. In fact, Price took it upon himself to propose his own legislation—a plan known as the Empowering Patients First Act—to repeal and replace the ACA. This plan later formed the basis for a subsequent proposal, the Patient’s Choice Act (PCA), which was introduced by House speaker Paul Ryan last June. Unlike the ACA, which expands Medicaid, the PCA would restrict Medicaid to low-income disabled people, moving the rest of its beneficiaries to private insurance. Price says that “patients and doctors should be in control of health care,” claiming that under the ACA “people have coverage, but they don’t have care.” The Congressman’s primary gripe with the ACA is that he thinks it interferes with the doctor-patient relationship. The trouble is that if patients can’t afford healthcare, there is no relationship to interfere with. As a former doctor, it appears that Price’s concerns lie more with the medical practitioners and ensuring their security than with the patients themselves. With Price now at the helm, it’s not clear if Ryan’s plan will be submitted as is, or if Price will now commit to an overhaul of the PCA. Given Trump’s backtracking after the election, it’s not even clear if the ACA will be dismantled as promised, or simply reformed. Regardless, it’s likely that health insurance programs, like Medicaid and Medicare, will cease to be entitlements, and be replaced by Medicare vouchers. So unlike every other developed nation in the world, the US will take a massive step away from ensuring that its citizens have universal access to health coverage. In place of the ACA, Price is proposing fixed tax credits to help people purchase their own insurance on the private market, along with health savings accounts to help people save money before taxes. (Further details of Price’s plan can be found here.) Critics worry that as many as 14 million Americans could lose coverage under Price. This legislation prohibits taxpayer funding of elective abortions, no matter where in the federal system that might occur...We have a responsibility, through our government, to protect the most vulnerable among us, not the least of whom are the unborn. This bill is an important step in the right direction. As HHS secretary, Price will make decisions about how abortions get funded with taxpayer dollars, and on policies related to the “conscience rights” of medical practitioners and healthcare workers. The elimination of the ACA could also make it more difficult for women to access contraceptives. Price has opposed federal funding for abortion and Planned Parenthood at every opportunity, and it’s not likely he’ll stop now. Of all the areas in which Price will now exert an influence, this is easily the most troubling. We’re all in favor of increasing funding for cancer research. The problem that the administration has is that they always want to add funding on, they never want to decrease funding somewhere else. That’s what needs to happen. So where, exactly, is that somewhere else? Price is an outspoken critic of research that involves embryonic stem cells, so it’s a safe bet he’ll start there, and in any other medical research area that violates his moral sensibilities. The NIH, which gets $195 million each year to conduct research into embryonic stem cells, should be worried. Thankfully, stem cells can be derived from non-embryonic cells, such as skin cells, but critical research into in vitro fertilization and new genetic techniques, such as mitochondrial replacement therapy to treat debilitating genetic disorders, rely on the use of human embryos. Science could take a hit this term, both in terms of reduced funding overall, and more specifically in cutting-edge fields that politicians like Price oppose on moral grounds. So while countries like the UK and China move ahead with biotechnological research, the US risks standing idle. During the election, both Trump and Clinton pledged to revise the way the government negotiates drug prices with pharmaceutical companies. Price’s track record would suggest he’s not on board with the President-elect’s idea of reducing the cost of medicine by setting drug prices under the Medicare Prescription plan. Nearly a decade ago, Price called the plan a “solution in search of a problem,” claiming that “If the government is forced to fix prescription drug prices, they will be forced to limit the medications available,” adding that “Limited choice will mean limited health care, and that is unacceptable.” Unless Trump wants to start a big fight with Big Pharma—and draw the ire of his new health secretary in the process—this is not likely going to happen. Americans can expect drug prices to remain unreasonably high over the next four years. Price still needs to be confirmed by the Senate, but Americans who value access to affordable healthcare, bodily autonomy, and medical research have a right to be worried. Suffice to say it’s going to be a long four years in the world of healthcare.